The Poetry of Blatz Beer? 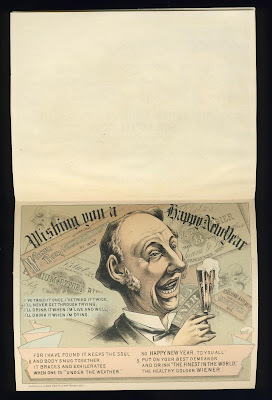 Check out this great 1883 New Year's greeting card and its poetic ad for Blatz beer, all products of the Valentin Blatz Brewing Company of Milwaukee, Wisconsin. 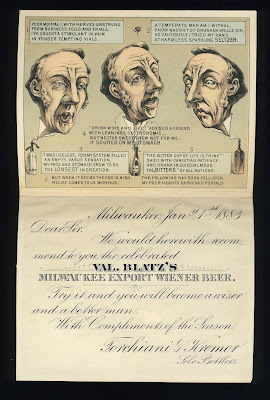 At the time of this card's issue, Mr. Blatz was still operating the brewery he'd started in 1850 right down the road from Johann Braun's City Brewery (est. 1846). Upon Braun's death in 1889, the two companies would merge to become the third largest brewer in Milwaukee. In 1959, the Blatz brand label was sold to Pabst, and in 2005-2006, the Valentin Blatz Brewing Company Office Building was converted into condos.